The phrase “rod and staff,” used in the Biblical book of Psalms, has strong associations for people of the Christian faith. What many people may not know, however, is that these tools, so important to ancient sheep herders who kept the animals for meat and fiber purposes, are still used today by shepherds who prefer traditional techniques. Staffs and rods feature prominently in shepherding exhibitions, where herding skills are judged for competition. What Are Rods and Staffs? Livestock management will occasionally require keepers to move herds and catch single animals. A chief consideration in both of these is the animal's “flight zone”: the area around an animal where keepers move without spooking it. “Point of balance” is another important concept -- animals prefer that people stay shoulder-adjacent and will move to ensure this. The rod and staff allow the shepherd an “extended arm,” allowing control over an animal without breaching a sheep's flight zone or point of balance. A shepherd's rod is a crafted club whittled from solid wood, often featuring an enlarged knob at the end. To use the rod defensively, simply lob the club toward a predatory animal to scare it away. Practice with your rod to improve heft and control over the weapon. 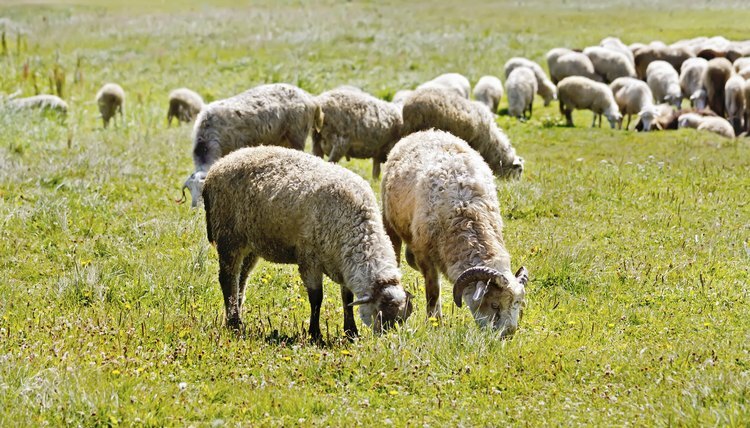 Once skilled accuracy is achieved, toss it near sheep splintering from herd movement without compromising flight-zone-safe placement and your point of balance with the overall herd. The staff -- more commonly referred to as a crook -- is indispensable for traditional shepherds. Grip the shaft of the staff's uncurved end, using the tool as an extended arm. A sheep has more power with his head pointed downward. So, minding your body's placement outside the flight zone and at the point of balance, reach the crook toward the animal's head. Hook the crooked end around the neck and pull the chin up, then move the animal back to the herd. The staff is a shepherd's multipurpose tool, providing an array of services beyond catching. Fit the crooked end under your armpit and lean into it to remove weight from tired legs and feet. If your crooked end features a second, smaller, upward curve, shove the staff's stick-end into the ground; with the tool standing upright, hang a lantern on the little hook to create a lamp. When walking, grip the top shaft with one hand for use as a walking stick. What Kind of Habitats Do Border Collies Like?